Think of it as a solidarity toolbox, full of ideas for a free Palestine. Please feel free to download and rebroadcast any of the interviews below, crediting the CKUT community news collective. For more information, email Aaron Lakoff at news@ckut.ca. All segments are between 10-20 minutes in length, and come with musical bookends (intro and outro). Ian Ilavsky is the co-founder and co-owner of Montreal independent record label Constellation Records. Ian Ilavsky signed the Artists Against Israeli Apartheid statement in 2010 in support ofBDS-Boycotts, Divestment and Sanctions campaign and Constellation Records has recently released a statement on their website condemning the recent Israeli war crimes in Gaza. Kevin Lo is a Montreal based artist and community organizer. He is the founder of Loki Design, which is an independent graphic design studio based here in Montreal and he teaches design at Concordia University. He is also a committee member of the Imaging Apartheid initiative, which is a poster project in solidarity with Palestine and is the co-creator of the online memorial “In Gaza”which lists all of the names of the Gazans who have been killed in the recent Israeli operation. Grace Batchoun is the VP Public Relations of CJPME (Canadians for Justice and Peace in the Middle East). CJPME is a non-profit and secular organisation. One of its main missions is to enable Canadians of all backgrounds to promote and work for justice and peace in Palestine. Recently CJPME released an instruction guide called “Speak up for Palestinian human rights”. 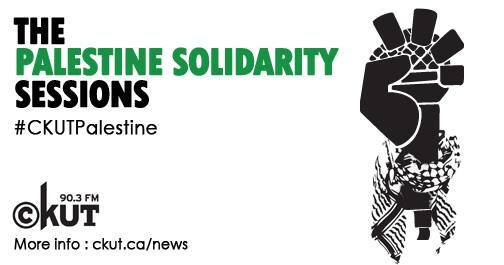 The goal of this guide is to provide Canadians with tools that will help them defend Palestinian human rights and raise awareness about the struggle of the Palestinian people. In this interview, Nora talks about CPFQ and how it was founded in the 80s as a way to help the Palestinian community in Montreal. She also discusses the importance of maintaining and promoting the Palestinian cultural heritage to resist cultural appropriation by Israel. Nora also explains how you can volunteer within CPFQ to help with the different activities they participate in, this include the upcoming Orientalys festival taking place from August 29 to September 2nd. Hanna Kawas is a Palestinian-Canadian originally from occupied Bethlehem. He is currently the chairperson of the Canada Palestine Association of Vancouver. Hanna is also a long-time media activist and the producer of “The Voice of Palestine“, which used to air on Coop Radio in Vancouver, and is now hosted on a Youtube channel. In this interview, he analyzes the Canadian mainstream media coverage of the Gaza massacre, and offers the listener tools to break down media myths, as well as to search for more accurate independent reporting on Palestine.